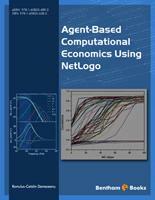 The eBook explores the techniques, researchers can create, use and implement multi-agent computational models in Economics by using NetLogo software platform. Problems of economic science can be solved using multi-agent modelling (MAM). This technique uses a computer model to simulate the actions and interactions of autonomous entities in a network, for analyzing the effects on the entire economic system. MAM combines elements of game theory, complex systems, emergence and evolutionary programming. Monte Carlo method is used to introduce random elements. The models simulate the simultaneous operations of several agents in an attempt to recreate and predict complex economic phenomena. The process is one that starts emerging from the micro to macroeconomic level. Individual agents are presumed to act in what they perceive as their own interest such as reproduction, economic benefit, social status, provided that their awareness is limited. The last chapter presents the results of the computational experiments conducted in the fourth chapter. Agent-based Computational Economics applies an interdisciplinary approach that combines knowledge from Agent-based Computational Modelling and Economics with the scope to observe, analyze and discuss the evolution of an economic system composed by intelligent agents. From 1990 till now, agent-based computational modelling has gained much attention but despite this phenomenon a fundamental issue is provoked by the next key question: Can agent-based computational model represent economic reality? To answer this, we must say that any agent-based model is a model of a real economic system that takes input data and creates output data by running computer experiments. The development of theory and applications of agent-based computational models determined in the last years has brought a real revolution regarding the modelling of complex social systems. Presently, we can say that there is a real confrontation between the adepts of equation-based modelling and of agent-based modelling. A similar "war" was encountered at the end of 19th century and the beginning of 20th century between classical economic school and neoclassical one that lasted till the middle of 20th century with the victory of neoclassical school of Economics. Starting from 1990, Agent-based Economics started an offensive movement in order to obtain important position in the system of mainstream Economics. If agent-based economic theory will gain the confrontation with equation-based theory then all the system of teaching economic sciences will dramatically change in the sense that students will use economic games implemented using agent-based modelling in order to obtain necessary abilities to be successful economic agents on real global economic market. At present, students memorize a set of economic theories that help them to pass exams; in the future, such students will have to pass "exams" implemented like economic games that will force our students to gain necessary abilities for becoming successful economic agents. This new training process will be exactly as the one used in our days for training pilots of airplanes; the pilot must pass the exam with flight simulator in order to become pilot of real airplanes. In other words, students must pass exams for administration of a simulated company implemented in the frame of an economic game in order to become active agent on real economic market.